The Complete Bruckner Edition on 45 rpm records! Welcome to the Newsletter from Abruckner.com! 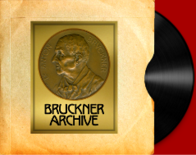 As of April 1st the Discography Database and the Bruckner Archive Database have been updated. The underlined headlines below will take you to the various sections of the website where the bullet points below are featured. Please use these as guides to the new information offered since the last newsletter. I do not usually single out a recording for special comment in this discography, but there has recently been a release that may slip by un-noticed that has some unique features. The performance is of the Bruckner Symphony No. 9 performed by Andras Keller and the Concerto Budapest. The recording in question is TACET SACD S 245. This performance was released on both a CD and on a hybrid SACD. The unique feature can be heard on the SACD when played on a 5.1 surround sound system. When listening to the recording with this equipment, the listener is placed in the middle of the orchestra! It's certainly not the normal listening experience but it is fascinating. I have a few copies in stock and it is readily available online. Just make sure you are getting the SACD version. Some new items have been placed in the Bargains and Collectibles Section. Please take a look at the Collectibles/Bargains section of my webstore. Right now, there is an assortment of CDs, videos and books available. Be sure to look at the listing of "assorted" since new items were just added this week. CASH REWARD FOR WANTED RECORDINGS. Click here for details. Georg Tintner's opinion of the Symphonic Prelude. ABC Classic launches a download / streaming service with a Bruckner Symphony No. 8. Bruckner Archive acquires an original Bruckner photograph. The program for the 2019 BrucknerTage Festival St. Florian is announced (August 15-25). Gerd Schaller's continues his Bruckner recording project during the 2019 Ebrach Summer Music Festival. Gerd Schaller's revised Finale completion to the Symphony No. 9 is released on CD. Eduardo Chibas' series of Bruckner recording with the Venezuela Symphony Orchestra is being released in Japan on the Tobu label. A unique Bruckner Graphic is being sold on this website. Time to renew your membership- The member area password has been updated. If you have not renewed your membership in the past year, you no longer have access to the materials in the member area. 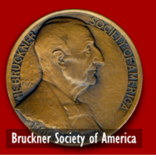 Annual membership in the Bruckner Society is $30.00 per year. Your donations will help fund further research, performances and publications. Receive one of the Society's exclusive CDs or publications with your contribution! Select them here. The Bruckner Archive recording database (with over 9,600 listings) has been updated and it is easy to download as an Excel file. 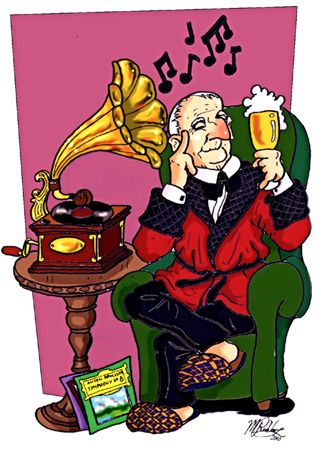 Many of these recordings are available to collectors and researchers. Contact me for details on how you can fill in some holes in your collection. There are many subjects covered here and these are frequently updated, so make it a point to check out the various subjects under this heading. BR Klassik releases a Symphony 1-9 cycle with first commercial release recordings of performances by Mariss Jansons and Herbert Blomstedt. Gerd Schaller's revised completion of the Finale to the Symphony No. 9 is released by Profil with extensive annotation. St. Laurant Studios releases Klaus Tennstedt's recording of the Bruckner 8th with the Philadelphia Orchestra and with the Minnesota Orchestra. They also release the Tennstedt / London Philharmonic Bruckner 7th and the Mravinsky / Leningrad Philharmonic Bruckner 9th..
Philips releases the Haitink / Concertgebouw Bruckner cycle in a re-mastered CD / Blu-Ray audio edition. Order here! Linn Records releases a Bruckner Symphony No. 6 with Robin Ticciati conducting the Deutsches Symphony Orchestra. NOTE: This CD has been delayed at the US distributor. Gramola releases the 2018 BruckerTage performance of the Bruckner Symphony No. 7 with Remy Ballot and the Altomonte Orchestra St Florian. The SACD is hybrid and surround sound. BR Klassik gives us a Bruckner 9th with Mariss Jansons conducting the Bavarian Radio Symphony Orchestra. The Philharmonia Zurich releases the second in their Bruckner series - A Symphony No. 4 conducted by Fabio Luisi. MD&G releases a Bruckner 3rd with Thomas Zehetmair conducting the Musikkollegium Winterthur. Tacet Recordings releases a CD and a surround sound SACD of the Bruckner Symphony No. 9 with Andras Keller leading the Concerto Budapest. SPECIAL NOTE should be made of this recording in its surround sound SACD format - The recording puts you into the middle of the orchestra for a unique listening experience. NEW! Memories Reverence releases Bruno Walter's Vienna Philharmonic recordings of the Symphony No. 9 (1953) and the Te Deum (1955). King Records in Japan is releasing an early STEREO recording of the Symphony No. 7 with Wolfgang Sawallisch conducting the Vienna Symphony (from a concert given in Tokyo). Exton releases a Bruckner 9th SACD with Toshiyuki Kamioka conducting the New Japan Philharmonic Orchestra. Early pressings have an editing defect. The Orchestra Maggio Musicale Fiorentino will be releasing a Bruckner 4th with Zubin Mehta conducting. Altus issues a CD with Lothar Zagrosek conducting the Konzerthausorchester Berlin in Bruckner's Symphony No. 9. Memories Reverence releases a Bruckner Symphony No. 8 with Rafael Kubelik conducting the Chicago Symphony Orchestra (rec. 1966). Profil releases the Gunter Wand / NDR Bruckner performances on LP. An unusual recording was discovered on Ebay that was not known of before. It contains a performance of the Symphony No. 4 with Gerhard Markson conducting the Barratt Due Symphony Orchestra. The concert took place in Oslo in 2005. Recordings of the Symphonies 4, 6 and 7 performed by the Internationales Akademieorchester conducted by Johannes Klumpp have been added to the Discography and the Bruckner Archive. The Madison Summer Choir will be releasing a CD of their recent performance of the Bruckner Mass No. 1. DOWNLOAD OF THE MONTH. The April Download of the Month offers a recording of Bruckner's Symphony No. 4 with Okko Kamu conducting the China Philharmonic Orchestra. It comes from a 100 CD boxed set of the orchestra's recordings. The store is divided up into sections for CDs & SACDs, Videos, Exclusive Recordings, Special Imports, Books & Scores, Downloads, and Samples and Collectibles. Be sure to check out each section for new items. Abruckner.com has entered into an agreement with the publisher of the MWV's Bruckner scores and publications. Order scores and critical reports from Abruckner.com. Click here for details. **** Next order deadline: June 30, 2019. As stories in the LATEST NEWS section get older, those that are still relevant get moved into the FEATURES SECTION. There is a wealth of information here that you may have missed when they were first posted. Essays in English and other languages are entered as they are discovered or accepted. New graphics (over 1,100) are frequently added. PLEASE SUPPORT THIS SITE All the information provided on this site is available to you free-of-charge. But it is not free for me to get it to you. Recordings must be purchased as does the server space upon which this website is stored. We have provided two easy ways for you to support this venture. First is to purchase recordings in my web store and second is to make your regular purchases (of anything!) through my homepage web links to online retailers. Purchases will support the ongoing expenses of operating this website.